Are Females More Sensitive to Funding Options When it Comes to Studying? As part of the Student Sentiment Index; the sensitivity to funding experienced by prospective students is one of the major influences on their likelihood to pursue study in the next 6-12 months. Understanding prospective students and their perceptions of education is crucial to anyone operating in the sector. But, with so many variables influencing their views; it can be hard to stay on top of changes as they come. The Sensitivity to Funding Index measures perceived financial dependency of prospective students in Australia. When we compare responses against demographics, some very interesting insights emerge. One of the more interesting findings of the Sensitivity to Funding Index is the impact gender has on a respondents sensitivity to funding. Females have consistently remained more sensitive than males, with this increasing steadily over the past 18 months. When determining a cause for this, it’s important to consider the areas that typically attract the most attention from Government Funding. The National Skills Shortage List contains the Government’s High Priority occupations. These are the industries which are lacking skilled workers, many of which highly important for future economic development. It’s also where Government funding aligns with a need to encourage more students to train in these fields. The majority of industries on this list are in trades, technology and engineering. When we compare this with the percentage of female representation in these fields; what we see is that they are highly disproportional, with an average of 18% female employment share. While the majority of funding is focused on high priority industries, because many of these are male dominated areas, females can be less likely to enter these fields due to lower representation in the workforce. The Free TAFE courses listed in the Free TAFE scheme in Victoria, for example, align with the Skills Shortage occupations, with the majority of qualifications being in the trades. This could be one explanation for the higher sensitivity to funding seen from female respondents, who may have less access to funding options compared to female dominated industries such as education and health care. When we looked at the Student Urgency Index, we saw that those aged over 40’s showed the greatest urgency to begin study. Interestingly, in the Sensitivity to Funding Index, what we again see, is a rapid increase in sensitivity to funding for this age group. While the 25-44 year olds remain the most sensitive, there has been a steady increase from the older age groups, those in the 45-54 group and over 54’s. 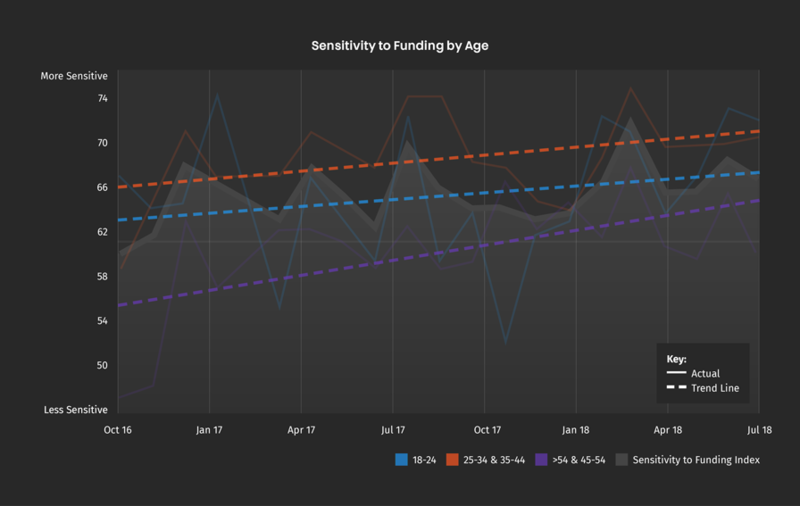 Based on this trend, the Sensitivity to Funding Index shows this age group within a few points of the 18-24 year olds and the trend likely to continue. To understand the motives behind prospective student’s decision to study, the key lies in data. The Sensitivity to Funding Index is the latest addition to the Student Sentiment Index series. To keep up to date with the latest insights, subscribe to our newsletter today.